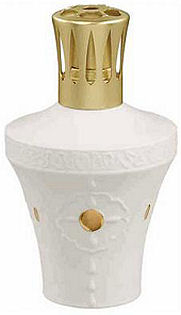 The Alhambra has a Spanish motif in Limoges white bisque porcelain with a raised gold 24 carat hand painted medallion. The lamp has an elegant simplicity. The Alhambra lamp has been retired but Imperial Galleries still has a few available. the lamp comes in a nice Lampe Berger gift box with a burner, funnel and instructions.